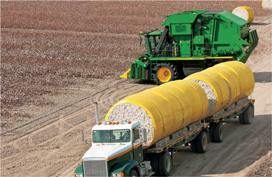 Eliminate the need to manually tag round cotton modules with John Deere Harvest Identification (ID), Cotton. 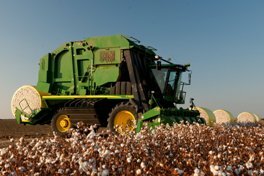 John Deere Harvest Identification, Cotton allows producers to be able to automatically document module production from the cab of the CP690 Self-Propelled Cotton Picker or CS690 Self-Propelled Cotton Stripper. John Deere Harvest Identification, Cotton utilizes the radio-frequency identification (RFID) reader on the CP690 Self-Propelled Cotton Picker or CS690 Self-Propelled Cotton Stripper to read the module serial number off the RFID tags that are embedded in the round cotton module wrap. The module serial number is sent to the Application Controller 1120 and combined with the client, farm, field, variety, and machine identifier plus the date, time, and GPS position of where the module was wrapped if equipped with a StarFire™ Receiver. After the information is compiled in the Application Controller 1120, the .txt file is sent to the GreenStar™ 3 2630 Display and stored in the file server. When it is convenient for the producer, the file can easily be transferred from the display to a computer via Wireless Data Transfer, USB or data card in order to electronically submit the information to the gin. Easily track module production with two customizable and resettable counters. 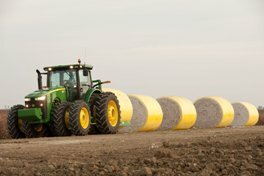 John Deere Harvest Identification, Cotton not only documents the critical module information as the round cotton module is wrapped, it also provides two counters that increment up each time a module is wrapped. This provides the ability for producers to set each counter for specific information. For example, one counter may track module production per field while the second counter tracks total cotton module production for the harvest season. Each counter is resettable at any time to allow for maximum flexibility and customization. John Deere is simplifying the transfer of module information from the producer to the gin. With John Deere Harvest Identification, Cotton all critical module information such as module serial number, client, farm, field, variety, latitude, and longitude of where the module was wrapped is captured in the ModuleID.txt file. The ModuleID file is stored within the file server on the GreenStar™ 3 2630 Display or the GreenStar 2 2600 until it is easily downloaded to any office computer and emailed to the gin or uploaded into the gin's business system. Wireless Data Transfer can also be utilized to automatically send Harvest ID data to MyJohnDeere Operations Center so that it can be shared with any trusted advisor or gin.